Hunger Walk participant Mort Zukerman celebrates being a part of the community fundraising event for 37 years. Sunday, May 7, 2017 @1:30p.m. Come and join us for the 40th Annual Access Hunger Walk! 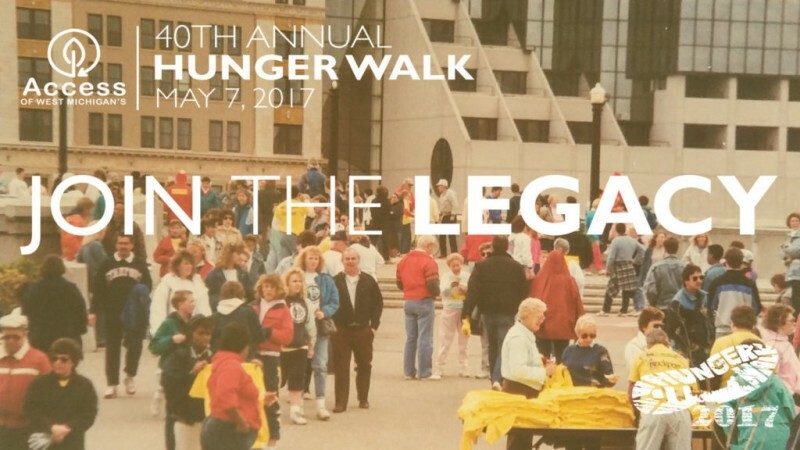 The Access Hunger Walk is an Annual 5k walk through downtown Grand Rapids. It enlists the community to raise awareness and financial support for 20 local and international non-profits. The work of these non-profits ranges from community gardening projects, food system policy work, nutrition programs, food pantries and gleaning programs, to food justice and community development initatives. 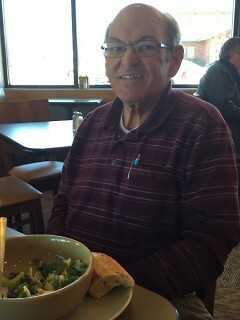 Mort Zukerman is one of the many participants in Access of West Michigan’s 40th Annual Hunger Walk. Although, this isn’t his first time. Or second. Zukerman has been walking with and recruiting for the Hunger Walk for 37 years! Since the 1980s, Zukerman, 68, has been participating and encouraging others to raise awareness of food insecurity our communities. As an avid movie buff and leader in the community through the Jewish Film Festival and Cultural Council, he encourages others to get involved in social action. Zukerman has lived in Grand Rapids his entire life, except for some time in Florida. He was a member of Temple Emanuel in Grand Rapids and a board member who pursued a social action committee. As part of this growing committee, he was asked to participate in the Hunger Walk. The next year, he was ready, not just as a participant, but as a recruiter to encourage others at Temple Emanuel to participate. Today, Zukerman is part of Rodef Shalom, a small Jewish group that he helped begin along with others from Temple Emanuel. Why does he continue to walk and equip others? Because he doesn’t want people to lack good food, he said. Through the changes, whether at Rodef Shalom or Temple Emanuel, Zukerman consistently promotes the Hunger Walk. Through the years the Walk has changed too, from leadership to route location to shortening the main route. Some years, the walk route would weave through the west side of Grand Rapids, the area where Zukerman grew up and knows well. Yet, changing up the routes has been beneficial. Zukerman has greatly appreciated the community involvement with the annual walks. As he has been involved with the walk for 37 years, he’s developed relationships with volunteers, recruiters and other walkers. One year his friend walked with his guitar slung around his neck, strumming as he walked. Each year, upon approaching the registration table, “I’m always running into someone I know,” he said. With each year he recruits fellow walkers to join him in promoting a thriving food system, he may get more walkers and donations desired, or fewer. Whether through flyers, bulletin announcements, emails or word-of-mouth, Zukerman tries to share the event with as many as possible. As the Hunger Walk reaches its 40th year, Zukerman hopes that the support raised will continue to empower the good food system and alleviate hunger, he said. With the differences and developments over the years, the mission and vision of the walk has remained the same. “It’s an extremely worthy cause to get the word out there,” he said. Want to join the legacy? Visit the event page to learn more about how YOU can get involved!